Some smaller tools are more useful than larger ones. A dentist uses a tiny drill and not a concrete jackhammer. (Thank goodness). 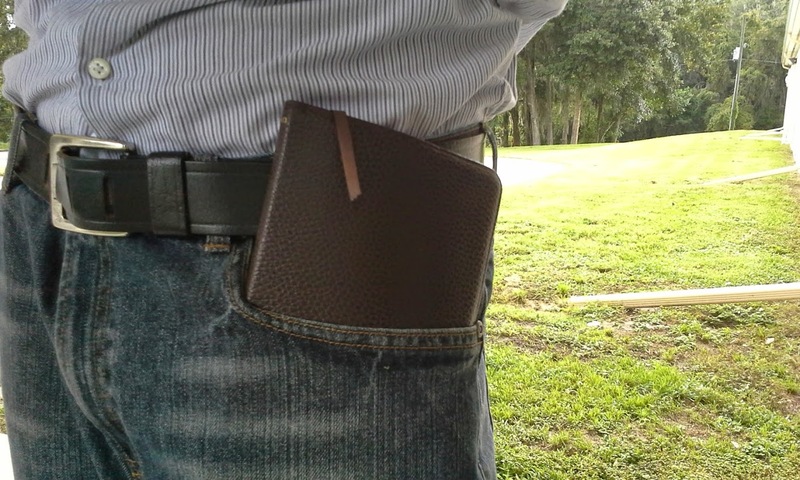 A smart phone should fit in my jeans pocket; I don’t need a backpack to tote it around. The reason the Lone Ranger carried a six-shooter in his holster instead of a rocket launcher is that the shoulder-fired weapon couldn’t fit on his horse! 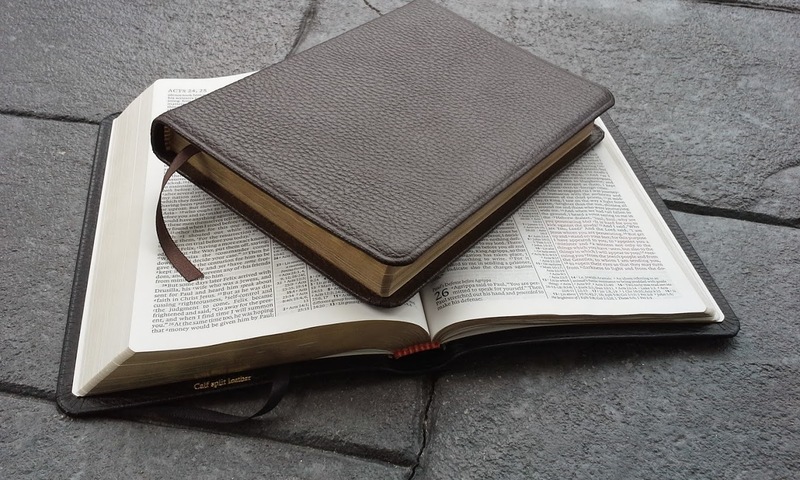 When it comes to Bibles, there are very good reasons to have very large Bibles. 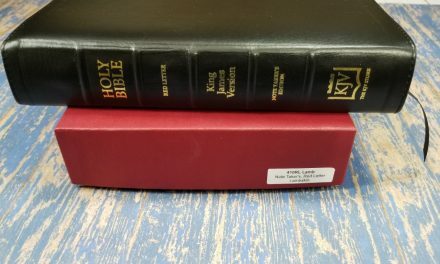 Some study Bibles have more material than the first year of seminary. My study Bible is so large we have to rent a U-Haul to take it to church. 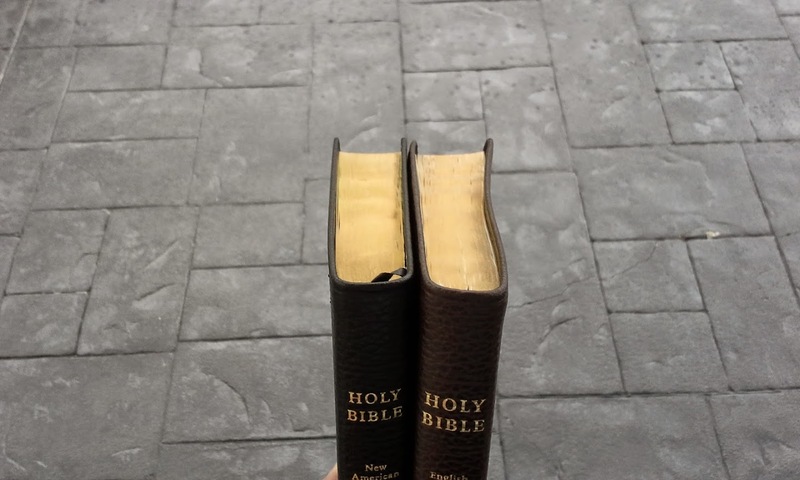 Other Bibles need to have extra-large print for aging eyes. I get that. No problem. 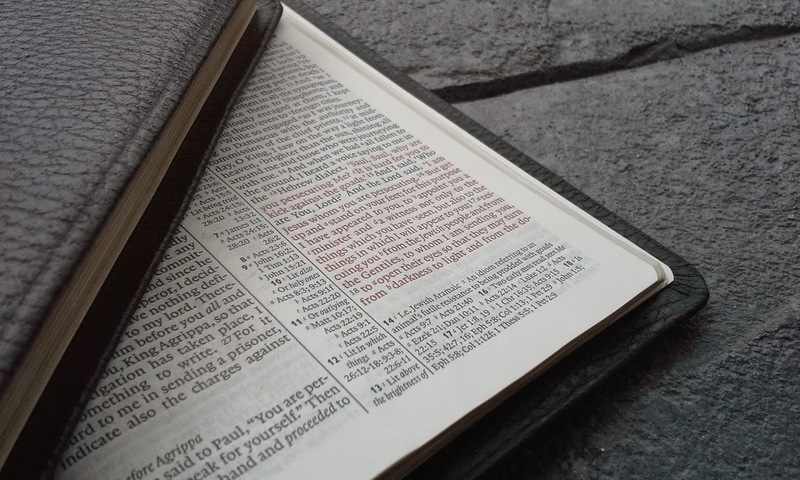 On the other hand, some very quality Bibles come in very small formats that are extremely useful to the lover of the Word of God. 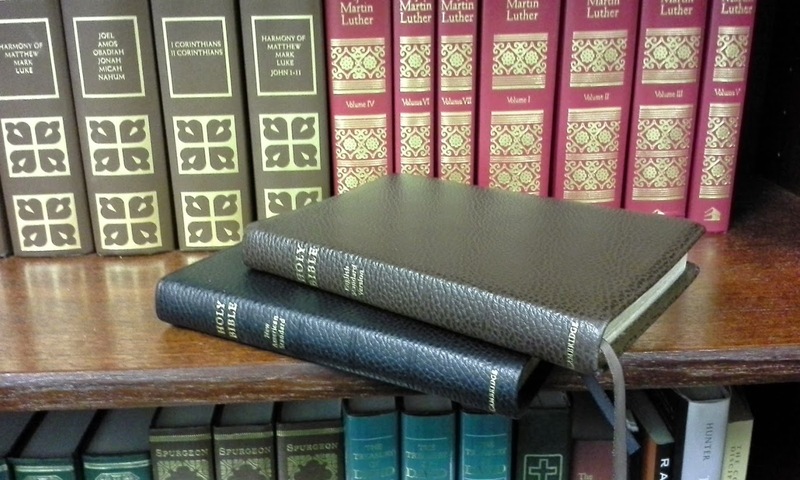 Such is the Cambridge Pitt Minion series, including the two Bibles featured in the review below. 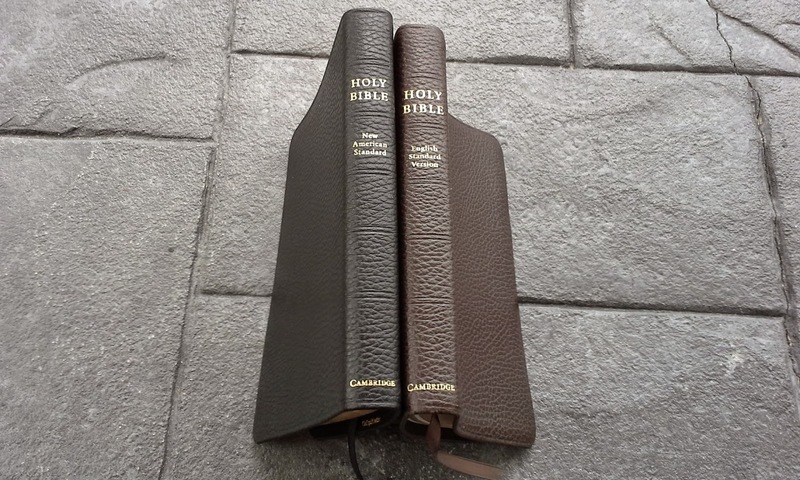 Today I will be doing a duel-review of both the ESV (brown) and NASB (black): both in the same size, text, font, and calf split leather. Font: Lexicon No. 1 in 6.75 and 7pt. This is going to be a love it or hate it Bible for many readers and it all comes down to what I mentioned in the lead in, the size of the book. This is a small Bible. It’s not quite so small that it can fit into the front pocket of your best church button-down, but it is small enough to get into the front pocket of your day-off comfy jeans. 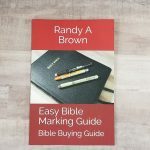 Let me be clear: if you struggle with small print, do not get this Bible. You will return it the moment you open it up. But stay with me young-eyed folks: this Bible has some serious firepower if you can get past the 7 pt. 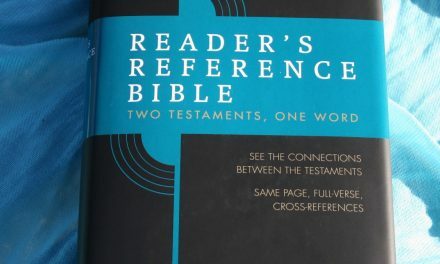 font that is used in the main text of the Bible. (The references are even smaller). Alright, so let’s talk about the font. How bad is it? Well, it’s pretty small. I like to give a Bible the old “quarter dollar” test. When I place a George Washington onto a prose section of the text, the coin covers up ten whole lines of text. That’s pretty small folks. Just for comparison, the Crossway Legacy gets a seven by the same standard. At the same time, the “form factor” was just right in my hand. I thought about it for a few weeks and sprung for my own Pitt Minion with a gift card I received at a speaking engagement. I am so glad I did. 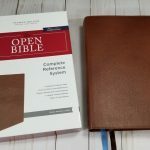 After getting my own copy (the ESV in brown came first) I realized just how clear the print really was. Small, but exceptionally clear like it was printed with a laser engraving tool by NASA or something. The double columns with center references are amazing. Something just works here; like Cambridge stumbled onto the perfect algorithm for column width and reference placement. It is beautiful, crisp and uses almost every square inch of the page. 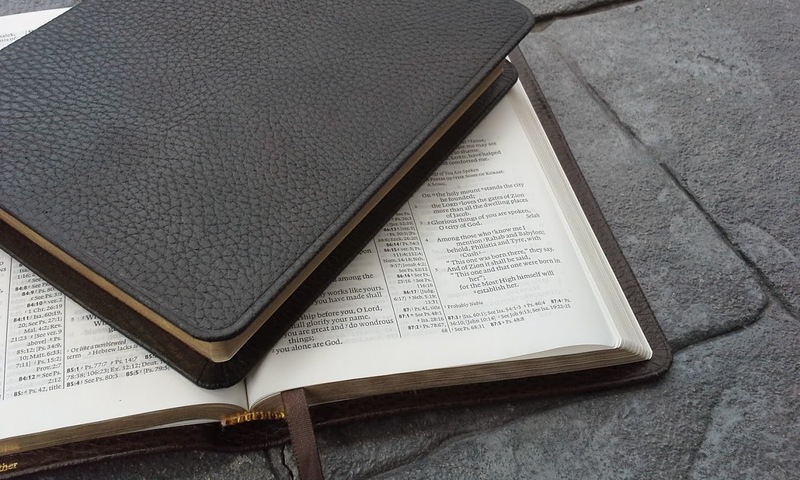 The first thing you will notice about this Bible is that the hand-to-Bible size ratio is perfect. If we have Bibles in Heaven, they will be this size and all of our eyes will be piercing enough to read them. 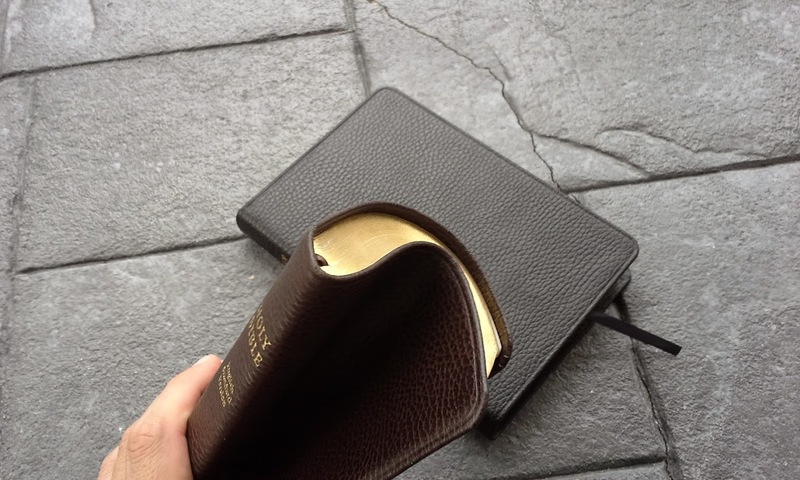 This Bible fits the hand like a glove. In fact, that’s exactly the analogy I would use to describe it: remember that baseball mitt you used to take into the street to play ball? How perfect it fit you that second year after you broke it in for a season? Yeah… Now we’re talking. The calf split leather is a steal for the price. (When they split leather across the length of the hide, the better part becomes known as “top grain,” while the lesser side is dubbed calf split). 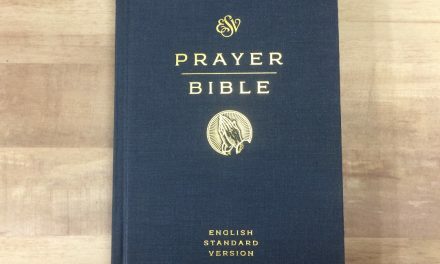 There are several more expensive versions of this Bible out there. I know that goatskin is all the rage among the serious collectors. But this split calf works in so nice after a while, I really don’t think I’d spring for the upgrade. I’ve been carrying it around for a couple months in my messenger bag and it now feels like the leather quality somehow went up several notches. 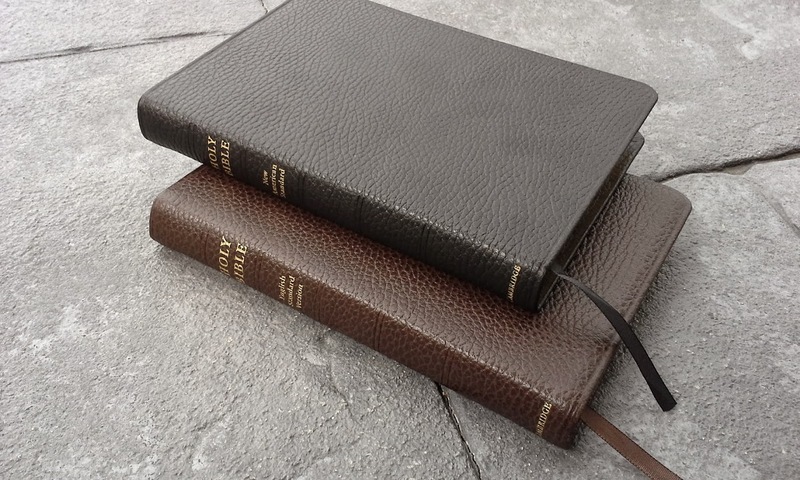 A few months after I’d had my ESV in brown, I received a tip that the NASB in black was on sale. Some of us thought they had put $28 on the sale page instead of $82 by mistake. Actually, I suspect that might be correct. So I bought the second one too. I still like the brown more. The texture of the grain is much more visible, nuanced, and mature. 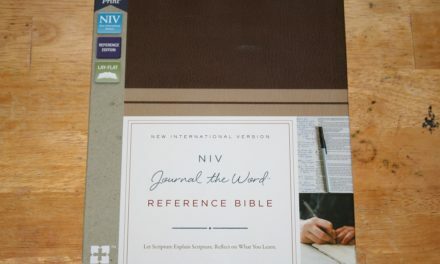 I also realized how much my brown ESV had broken in after a few months when I held the stiffer NASB right out of the box. I have every reason to believe it too would loosen up after a month of carry-around. 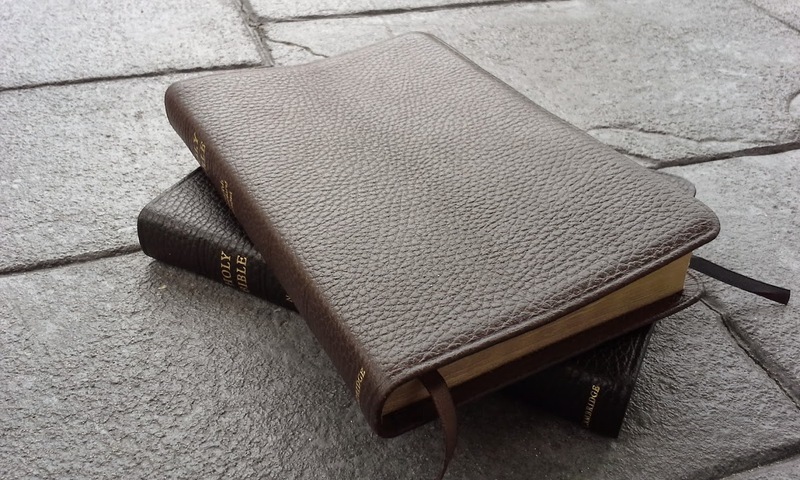 I’ll say this: if you think the leather-over-cardboard style of paste-down binding is too rigid when you first open this Bible up, do what I did: simply tote it around in your bag or briefcase for a month and you won’t believe how soft this leather actually becomes. As for the other features, the gilding is spot-on Cambridge quality. The binding springs open like a bird of prey ready to take flight. The line matching is faultless. Aesthetically – for looks and feel – it has neither weakness nor peer. 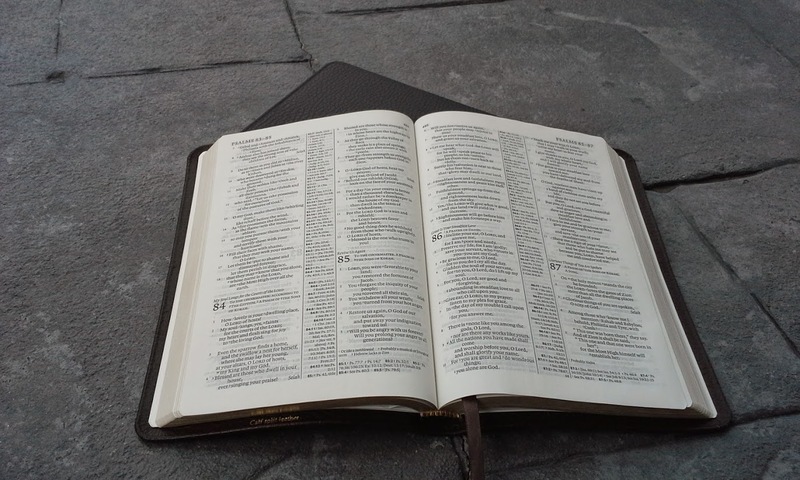 Here’s the bottom line: this Bible can easily be the Bible you take everywhere. 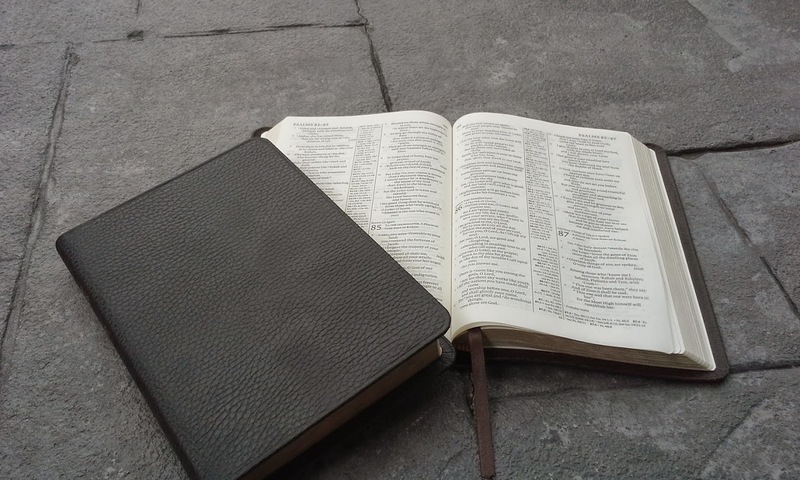 As a pastor myself, I always need a Bible. All the time. If I have a few moments waiting at Starbucks, I’m in the Word. When I go to staff meetings, we read and study together. When I go to the hospital, I always take my Pitt Minion. Since it does fit in the pocket of my pants, I can tap the hand sanitizer and scrub up without setting it my Bible down on a germy sink or changing station. It comes right out of my bag in the evenings again for elder’s meetings. No, I probably wouldn’t want to use this Bible for my everyday devotional reading, but it is there when I need it. Trusty. Reliable. Just the right tool for the job. And that’s the point: this thing is going to be your “take anywhere” Bible. The Pitt Minion print size is small isn’t it? My Personal Concord has the same print size (I think), it is a little thicker with the same helps that the Concord has. I’ve been debating for some time about what to do for a bible for a bit larger print, with about the same size. I’ve about decided that an 8 point font is as small as I want to go eliminating some fine easily carried bibles. The choice for me comes down to the Cameo, or the Brevier Clarendon. I’ve just about decided on the Cameo though it is a difficult choice. I’ll probably go for the one with the Brown Vachetta Calfskin. I’ve looked carefully at the Pitt Minion, and after my experience with the Personal Concord, have rejected it because of difficulty reading it in poor light. 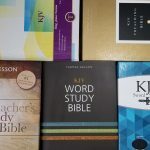 Others with younger eyes, (mine are 73 years old) would probably do just fine with the Pitt Minion, it is a beautiful bible. Hi Don. It’s a hard choice between the Cameo and the Brevier Clarendon. I am planning a comparison post that will show the two side by side and compare their features. I’ve been planning this post for a while but I haven’t gotten to it yet. I still have at least 3 reviews ahead of it but I’ll get to it asap. I think one of those two will be what you need. Neither one is a bad choice. I look forward to the comparison. As always you seem to understand the issues I raise. It is a hard choice, but I’m leaning towards the Cameo, at least for now.